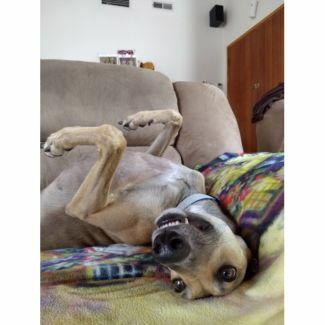 Amazing Greys is a private greyhound adoption group in Melbourne dedicated to finding loving homes for unwanted greyhounds. We rescue, rehabilitate and re-home former racing greyhounds but also young greyhounds who did not make it to the track. Amazing Greys has no kennels and all greyhounds live in loving foster homes. We always need more foster carers to keep our greyhounds safe until a permanent home can be found. Please get in touch via info@amazinggreys.com.au if you would like to find out more! Email foster@amazinggreys.com.au if you're keen to foster. 2) We will send you our adoption inquiry form so we can learn more about you, your family and lifestyle. 5) After a successful trial period, the greyhound moves in permanently with your family. We will keep in touch with you throughout the process and help you and your greyhound settle in. Boss is a 5 year old ex-racer who has had a bit of a rough start in his life. After a terrible accident on the track, he needed to have one of his legs amputated. Boss is completely healed from his operation and has been living life as a city apartment dog for over six months now, and enjoying the luxuries of 'pet life'. He is house trained and a very well-behaved boy who loves affection and deserves the very best in life. It goes without saying that he is a very special tripod greyhound! Boss doesn't let his 3-leggedness worry him too much and still loves having fun and living his life to the fullest. However, he does have a few special requirements for his perfect home. Stair free is a must, he much prefers to take the elevator like any hound about town. Floorboards and tiles can be too slippery, and he needs home that is fully carpeted (or very close to - kitchen and bathroom may be exceptions). Even rugs stuck down to floors in living areas or hallways can be problematic, as he gets very excited when his humans come home and slips on exposed bits of floor. 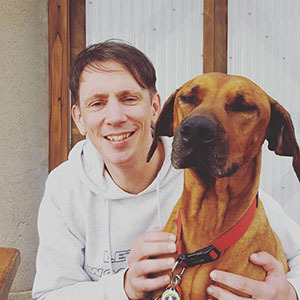 And although Boss loves the great outdoors, he would get a bit too excited in a large yard and risk injuring himself, so an apartment or townhouse with a small courtyard or balcony would suit him best. Boss is a really sweet boy who loves people but he can be a bit shy to begin with and needs a home with people who have the patience to take things a little slowly and let him get to know you. 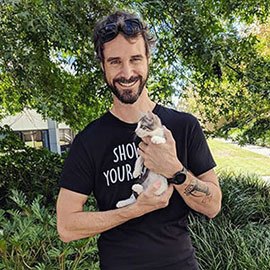 Once he is comfortable in your home and you've won his trust, he is your typical velcro grey who will bestow lots of smooches and love upon you. Boss is not cat-friendly and also would not be suited to a home with small dogs. At the moment he is happy being an only dog and getting all of his humans love and affection. 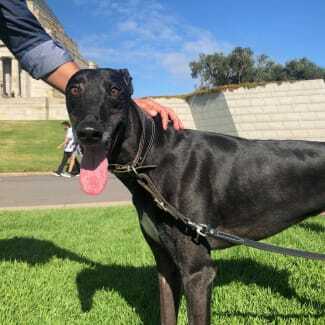 If our beautiful boy has stolen your heart and you think you can offer Boss his forever home, please email us adopt@amazinggreys.com.au or message us via this page. Our Magnificent Miss Maggy is on the search for her forever home. Maggy would love nothing more than to wile away her days snoozing on couches, snuggling up to her humans, and eating lots of treats. At 9 years of age, Maggy is a refined lady looking for no more then comfort, love and a short stroll or two around the neighbourhood each day. She’s quite a small lady at only 22 kg’s so will easily share your couch, providing lots of warmth and companionship. Maggy had a very brief racing career and then spent some time in the breeding kennels. She has been living as a pet for the past nine months and has adjusted very comfortably to the good life. She is house-trained and well-mannered indoors. Maggy is generally calm and quiet although she does sometimes like to play and gets excited to see her humans when they come home from work. Maggy has been living with a two-year old Labrador and enjoys the company of her canine companion. We think she would be well-suited to a home with another greyhound or large dog. She has not been tested for compatibility with small dogs. At the moment, she is happy to be at home with her canine friend while her humans are at work (and also gets to go to work and be an office dog occasionally – where she laps up the extra attention). Maggy has not lived as an only dog but would be willing to try however, if this were the case, a family who works part-time or from home would probably be best, so she doesn’t get lonely. 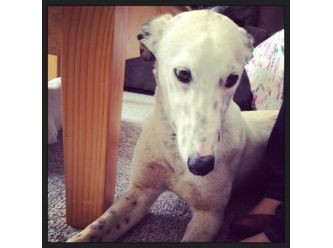 Maggy has a few small health issues which are typical of greyhounds her age and easily managed. She has a slight limp from a very old injury which doesn’t impede her daily activities at all. She has pannus which is treated with regular eye drops. Maggy has recently had a full dental clean but will need regular dental checks to maintain her dental health. 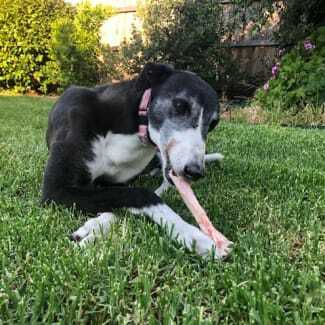 If our sweet, little senior has melted your heart and you think you could offer her the forever home she needs, please contact us at adopt@amazinggreys.com.au or message us via this page. Ziggy is a very sweet and goofy boy. Just try to resist patting that belly when he roaches! He can be a little shy to begin with and can be quite fearful of men in particular. For this reason, any men in the house will have to be very patient and let him come to you. He is a joy to play with and watch as he tosses a toy and pounces on it. Nothing can get his attention like a squeaky toy. He has been receptive to training and has the foundations down pretty well and has great potential. Like any greyhound he can be found on the nearest soft surface for the majority of the day aside from his walks and a couple of zoomies. Without other dogs around he can become quite anxious, but living in a foster home with a doggy friend has helped him settle. He's therefore looking for a home with another dog. He can be reactive to cats when outside but hasn’t been tested for cat-friendliness inside the home.